Keeping up with friends is faster than ever. See what friends are up to, share updates, photos and videos, and get notified when friends like and comment on your posts. 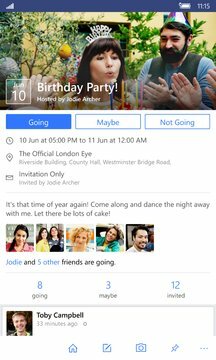 See what’s new with your Facebook friends from inside the People app, and sync Facebook events to the Calendar app. 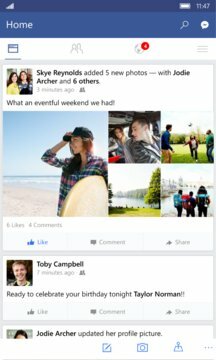 Thanks for being a part of our beta and helping to make Facebook even better on Windows Phone. Help us build a better app by sending feedback via Settings > Feedback in the app.